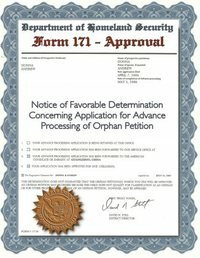 We got our 171 approval today. Actually, I drove down and picked it up from our local BCIS office. The processing time for this was about twice as fast as Gwen's 171 and I can only assume that it's because I sent our I600 with a sad little picture of Madeline and a personal plea that they expedite us. I figured it couldn't hurt and it sure seems to have helped! By the way, our 171 wasn't really as cool at the image above. I spruced it up a bit since it's too much of an important document to look so boring!